Oracle Engagement Cloud (formerly Oracle Sales Cloud) Review: "Oracle Engagement Cloud fits all our sales needs"
We used Oracle Engagement Cloud in the Sales and Marketing department. It helped to better manage sales opportunities through their life cycle. We knew who was doing what and who we were communicating with at all times and exactly where we were in the sales funnel with each client. This helped us to close more deals and faster. Very detailed organization with areas for notes, contacts, and stages of the sale. I would like to see easier to customize dashboards. Very suitable for all stages of the sales process. Even if there isn’t a sale, the work is not lost and can be used again in the future to try to work a deal again and follow up with the lead. It works well for companies big and small! 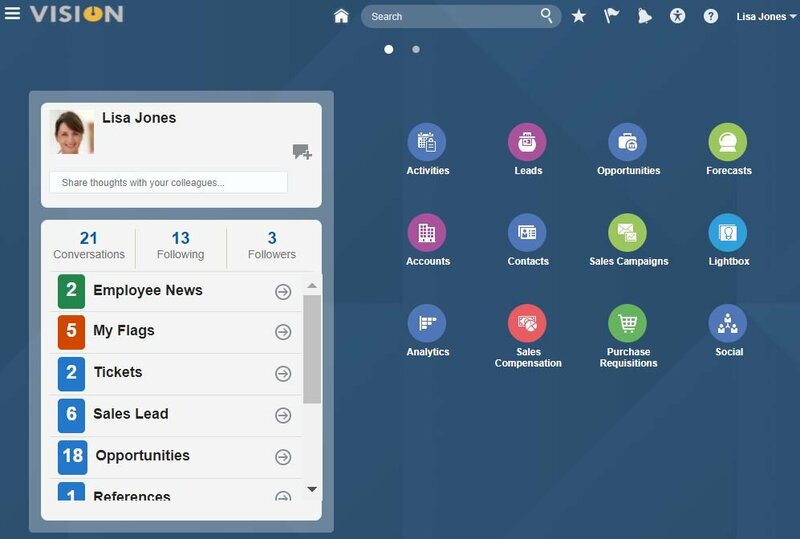 Oracle Engagement Cloud (formerly Oracle Sales Cloud) Review: "Engagement Cloud 2019"
Oracle Engagement Cloud (formerly Oracle Sales Cloud): "Oracle Sales Cloud - Mixed Review"
Oracle Sales Cloud is used by both our Inside and Outside Sales teams. We use it for tracking leads and opportunities, and also for monitoring how many of those leads and opportunities are converted to sales. In addition, we use it as best we can for managing and keeping track of our demo units. The product is good for tracking leads which can help you acquire new customers. The product is good for creating opportunities which can help you convert sales. The product can easily be integrated with other applications to make the transfer of data seamless. Although not necessarily designed for it, our sales team finds it difficult to use the product for tracking demo units. The mobile version of the application falls very short. Our IT department fields a lot of complaints regarding its functionality. Following application upgrades - which are frequent - we often have to rebuild some of the custom screens we created. The intended functionality of the application is designed well. Tracking leads and opportunities is easy so long as the users don't try to make the application behave in a way it was not designed. For instance, our sales team tries to use it for tracking demo models, but if falls short in this department. 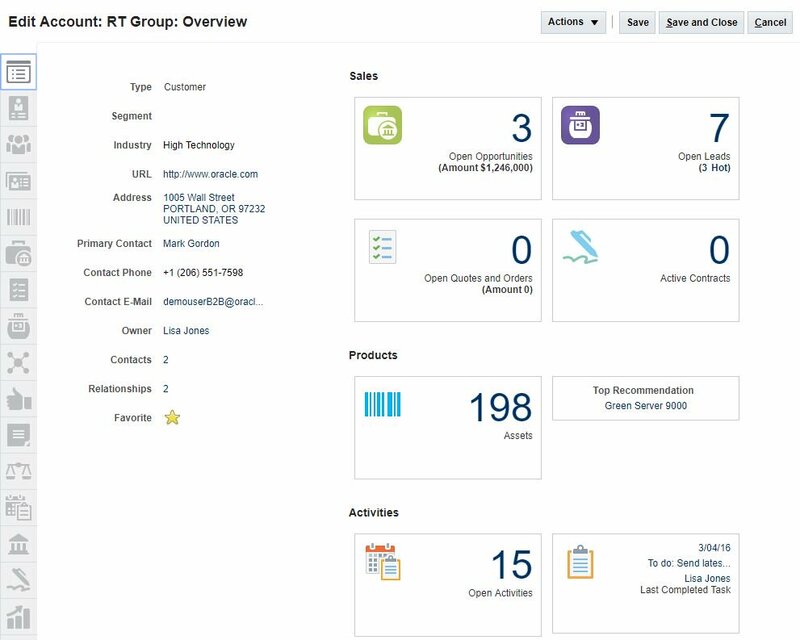 Oracle Engagement Cloud (formerly Oracle Sales Cloud) Review: "Oracle Engagement Cloud (OSC)"
Oracle Engagement Cloud is used by our Sales teams and Marketing team. We use this as our CRM and currently have a basic integration into Eloqua. There are so many clicks to get through the objects and create the activities. With our company we have many service offerings, we expect to be able to market at a personalized level. How we can easily see in the tool what service offerings are applicable to an Account/Contact should be easier. Only being in it in a year, we are still learning how to function in a cloud based environment. Oracle shares road maps, but those road maps don't always show what actually can be done right now. This has caused some frustration. Oracle Engagement Cloud (formerly Oracle Sales Cloud): "OSC Review"
We implement and fix current setups of Oracle Sales Cloud/Engagement Cloud for many different businesses. We also use it internally for sales purposes. It allows us to track the progress of our business. They fully customized multiple layouts that can show under certain conditions or security roles. They have fantastic customization features that allow clients to tailor the look to their business. It gives the user the ability to code a lot of additional configurations. Create an easier user interface for security jobs/roles in terms of assigning capabilities and visibility. Allow for more distinction between customized fields when adding them to layouts. It is suited for businesses that have more technical people to maintain the environment. It is not very appropriate for companies that require heavy reporting on a lot of data. Oracle Engagement Cloud (formerly Oracle Sales Cloud): "Oracle Engagement Cloud Review"
Oracle Engagement Cloud, integrated into our ERP, simplifies the visibility and improves the single customer profile between Finance and Sales. Using MDM in 18C we have improved the customer master and we are consistently reviewing the process. We now have a Sales Team across ANZ who can report on a single opportunity process across the region which is reported up the board. Master data management - Helps create a single customer record across Sales and Finance. Reporting - Engagement Cloud leverages the Oracle OBIEE reporting engine which alone is a market leader. AI - Embedded next best actions. Data as a service - Call upon millions of records of data with a simple click of a button. Clear product direction - Road map is sometimes hard to find and can only be 3 months ahead. UI - Reduced number of clicks to perform an action. It works great for multi-pillar Oracle deployments. Oracle Engagement Cloud (formerly Oracle Sales Cloud) Review: "Still floating." We are in the implementation process, so I don't have a lot of experience using the product. Allow Sales and CS work closely together. 360 view of the customer. The goal is so that if a customer calls our call center, I can tell when a sales person last talked with them. Or if they have a damage claim open, the sales rep will know before they try to sell them something else. I think this will be great (once we're fully implemented). So far, it's not very flexible. Extra steps to get information. I think it is a good match between Sales/Marketing/CS. Oracle Engagement Cloud (formerly Oracle Sales Cloud) Review: "A good solution with room for improvement." We use OEC to manage our Sales Force as our CRM. It is being used across various departments, both in sales & service. Using activities to track prospect movement. Whenever new releases take place, they often break other plugins or company-generated fields. 2/ When Oracle pushes an update it seems to break either plug-ins or customizations (fields, etc). ...and they don't seem to notify us adequately that these breaking changes are coming. Oracle Engagement Cloud (formerly Oracle Sales Cloud) Review: "OSC - easy data entry, but not intuitive"
Oracle Sales Cloud is being utilized by our sales and marketing departments primarily for customer relationship management purposes. It allows us to track basic contact data, demographic information as well as specific homebuilding desires. The ease of which to create and edit contacts. The ability to send mass sales campaigns and track recipient results. The ability to create custom reports and dashboards. The ability to mass update Activities based on Opportunity changes. 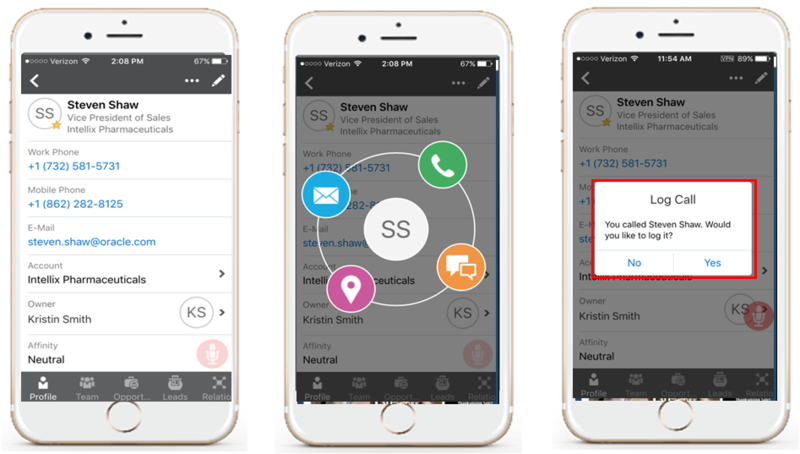 The ability to select contacts for Sales Campaigns based on Opportunity Info. The lack of intuitiveness that hinders user adoption. Simplified UI and being able to manage what users see/do based on role is helpful to maintain the quality and ease of use. It takes an IT guru or 3rd party implementer to help maintain all our customization and make sure each upgrade goes smoothly. Oracle Engagement Cloud (formerly Oracle Sales Cloud) Review: "Oracle Sales Cloud"
Oracle Sales Cloud is being used by our remote sales people handling our larger client sized population. It enabled them access to critical information about their clients, partners and prospects in a mobile, modern and intuitive format. OSC is very well suited to a simple sales model. It struggles with a more complicated relationship structure - but most SFA's do. Oracle Engagement Cloud (formerly Oracle Sales Cloud) Review: "Business Consultant"
We implement Oracle Sales Cloud for clients who desire to increase the visibility and manageability of their sales pipeline. With a robust offering of pre-built reports and the ability to create powerful custom reports, our clients have been able to identify soft areas and put practices into place to reduce the sales process time, leverage best practices, and scale more efficiently. Oracle Sales Cloud also brings teams together and allows better collaboration and communication with a single cloud platform. One word of advice, make sure to work with Oracle to fine-tune your environment usage needs so that they can ensure your environment runs as quickly as possible. Accepted page load times are at least 3 seconds. While pages usually load more quickly than that, a lot of traffic can slow the system. Oracle Support will work with you to make sure your page load time is optimal. Enables customers to customize their sales process(es) and provides Sales Coach functionality to assist the Sales Stage completion requirements and spread of best practices. Affords great visibility for management of the sales process with Infolets and robust BI Analytics tools. Data can be accessed and analyzed from the online Dashboard, object tabs, and on mobile devices. Territory Management makes it easy for organizations with a large sales team to define, assign, manage, and report. The NEW Enterprise Mobile application makes working away from the desk easier than ever. With voice-activated functionality and off-line accessibility, sales reps can spend more time in the field with clients and less in the office. Set-up, configuring and onboarding can be overwhelming. Unless you've had experience setting up a CRM solution, you'll most likely need to invest in a partner helping set up and maximize the system. While Oracle has been focused on infiltrating the SMB market, the cost and complication of just going live in the system can be daunting for small and emerging businesses. The speed of the system can be slow. Oracle has acknowledged this and has made strides in improving it. They will work with clients to speed up the system, but this is a cumbersome and frustrating exercise. I think it would be a great tool for SMB companies looking to scale. By leveraging out of the box processes, they can efficiently and quickly scale. For more mid-market and enterprise clients, the solution is customizable and secure enough to meet the most demanding requirements. Overall, if you have a growing or large sales team that you want to manage and lead more effectively, Oracle Sales Cloud provides the tools and resources for your team to spend more time focusing on the client and closing deals. Oracle Engagement Cloud (formerly Oracle Sales Cloud) Review: "Oracle Sales Cloud -- An Integrator's View"
We are an Oracle Partner who provides implementation information for our customers on best practices to use when setting up a CRM, and the CRM we choose is Oracle Sales Cloud. These best practices not only come from working with our customers using Oracle Sales Cloud, rather we also use it ourselves. I work from an Integration perspective. Using the API's thru web services is pretty easy, especially the merge function. Also, the Source System ID for Account and Contacts makes loading seamless without having to get the corresponding OSC Party ID. Seamless Account and Contact integrations in web services using SourceSystemReference Values. The key here is flexibility. A flexible solution, can easily work within the restraints of this product. Oracle Engagement Cloud (formerly Oracle Sales Cloud) Review: "Growing Solution with a Robust End-User Experience"
We use Oracle Sales cloud to track progress of a deal coming together, project milestones, as well as the source of our customer data for e-mail campaigns. It has greatly improved our billing and sales support processes. Our Account Managers are easily able to pull out historical sales data to identify future opportunities using the native reporting tool. Territory Management, it is relatively flexible but very powerful. It can be used as a security measure and is a foundation for more complex pillars of the application. Customizations - spinning up a custom object or creating a custom field could not be easier. Reporting - the reporting tool is great, the custom subject areas and joins are easy to build, and it is an end user-friendly tool. Security - depending on the use case, it can be complex to make sweeping changes to the security model. Workflows - the trigger points and the construction have some limitations that require some scripting to overcome. Organizing setup tasks - Natively, there's access to many different setup parts of the application, and due to the fusion model, a lot of these are unused pillars of the application and can cause confusion. Oracle is making strides in this area very recently. The tool meets the generic CRM use case really well, customers with longer sales cycles or large customer bases see the greatest benefit. With the applications native mobility, it makes it suitable for any type of customer. Perhaps, some of the more complex sales models, namely dealer related use cases where the end customer isn't clear, it is harder to derive value. Oracle Engagement Cloud (formerly Oracle Sales Cloud) Review: "Sail into Sales Cloud"
It is being used for prospects, leads and opportunity tracking. Our sales team uses it heavily. We also implement it for our customers. Easy to configure, no need to be a developer. They have added a service piece that is still maturing for B2B or blended sales/service organizations. They have incorporated the best of breed knowledge from their service cloud, but there are some features that are not available yet (but they are on the roadmap). Oracle Sales Cloud is well suited in SMB, Mid-Market and Enterprise businesses. It is extremely flexible and scalable. The biggest benefit is that it is part of Oracle’s suite of cloud products that work well together. Oracle Engagement Cloud (formerly Oracle Sales Cloud) Review: "Cautiously Optimistic"
We're in the process of replacing Oracle CRM OnDemand with Oracle Sales Cloud OSC). The newer platform seems to be a step in the right direction. We're using it for general salesforce automation, forecasting, and revenue attribution, as well as contact and account management. I'm in Marketing Ops, so my perspective is probably skewed more heavily towards lead management, conversion, and pipeline measurement/management. Comparatively speaking, OSC's interface does a good job in organizing objects. The home page layout is logical and intuitive, making it easy for even new users to navigate where they want to go. Mobile Interface - we're coming over from Oracle CRM On Demand, so the very fact that our users can leverage a mobile app is a huge plus. Object layouts are another plus - rather than cramming too much information on any one screen, having the ability to group like data sets in tabs is helpful, ensuring users can get to the info they need without having to sift through troves of data they don't care about. The lack of native campaigns is concerning. We marketers live and die by out campaigns (it's our view of the world), so not having a native campaign object to sync to from our marketing automation platform has caused some issues. Our integrator is helping us work through them, but the lack of a campaign object seems like a big miss to me. Speed (load times) seem slower than other CRMs, but as we are still testing, this may be a temporary issue. I'd consult others to confirm or refute this. Oracle Sales Cloud seems well suited for organizations not ready to jump into the salesforce.com ocean. It allows for customization and is far more user-friendly than older platforms (i.e., CRM On Demand), but it doesn't seem to fully account for all groups within the company (i.e., lack of an actual campaign object). Oracle Engagement Cloud (formerly Oracle Sales Cloud) Review: "Oracle Sales Cloud - For your sales need and beyond"
We have implemented Oracle Sales Cloud Release 10 to 12 for a healthcare client on east coast. Sales Cloud is used by roughly 50+ employees across the team. It's worth mentioning that they already used the whole host of other Oracle Fusion apps such as Finances, HCM and Sales cloud with the web as well as mobile apps. The Sales cloud is used from the VP to the sales reps and it allows them to keep track of all sales activities and have great analytics at the same time. As it is for any Fusion apps, Sales Cloud comes bundled with Social which is great to have for sales teams who communicate a lot internally. Fantastic analytics capabilities. Not only in terms of reports but also in terms of very interactive charts and visual components like Infolets. Customizable. For three different roles, we have three different dashboards which are completely custom made to ensure that each user sees the data relevant to them. A very solid solution with a lot of advanced features. Sales Cloud seamlessly integrates with other Fusion apps such as finance, PBCS, HCM. It's extremely complicated to implement yourself. From a client's perspective, this could mean additional budget to hire a big team to successfully implement the product. Sales Cloud has an awful amount of bugs. Oracle Support which won't help you even if there is a critical production issue. Difficulty in importing the data. This is especially a challenge if you have it in a huge amount. If you need a single solution that can be used not only by your executive team but also your sales reps and everyone else in between, Oracle Sales Cloud is a great option to go with. If you happen to have other Oracle Systems such as Fusion HCM/CRM/PBCS, it will only be logical to add this instead of any other application since they all integrate so well. Oracle Engagement Cloud (formerly Oracle Sales Cloud) Review: "Much more than just a CRM"
Oracle Sales Cloud is being used by a few different departments in my organisation. Specifically it is being used by the sales department, the customer service team, the marketing department, and it also feeds into other departments once orders are created. The business problem is addresses is our need for a robust customer relationship management system. Oracle Sales Cloud is a great platform for a company that wants to have a better overview of how their leads and customers are interacting with the company, and also when is the best time to reach out and engage with the customers. The fact that Oracle Sales Cloud is accessible away from the office is also very important to us because our Sales staff is typically on the road meeting with customers. Oracle Engagement Cloud (formerly Oracle Sales Cloud) Review: "Oracle Sales Cloud - CRM with Great Capabilities"
We use Oracle Sales Cloud mainly for its CRM capabilities. It is used by several departments throughout the organization such as Sales, Marketing, Customer Service, etc. The main business problem it addresses is helping us identify leads, track their behavior and engagement with the company across multiple channels, and manage the sales cycle. Provides leads for Oracle Eloqua. Tracks a lead's engagement with the company across multiple channels. Helps us identify the best time to engage with a lead. The integrated Oracle Social Network sometimes doesn't work on certain browsers. The main reason we like Oracle Sales Cloud is because it is integrated with multiple other products that we use in order to effectively conduct business. The lead generation and tracking is also very valuable, and as it is a CRM system I would think that it would be appropriate for any company since everyone has clients and would benefit from a CRM system. Oracle Engagement Cloud (formerly Oracle Sales Cloud) Review: "LaserTech's view of Oracle Sales Cloud"
Laser Technology, Inc. (LTI) was one of the early adopters for Oracle Sales Cloud (OSC). We implemented on Release 5. LTI has around 30 current users working in the solution working worldwide. As the product matured, the more user we incorporated. We utilize the Classic UI (Desktop), Simplified UI, Oracle Sales Cloud App for iPads, iPhones and Androids, Social Network along with the Outlook plug-in. LTI's Outside Sales Representatives live and breathe in the OSC. This solution helps them organize their days and have become more efficient. The OSC solution promotes positive teamwork between the Outside Representatives and their Inside Sales Support by having the same vision of a Customer in Leads, Opportunities and Activities. Our Managers have more visibility on the progress of their team. Immediate vision of transactions between the Outside and Inside Sales team for a positive teamwork experience. 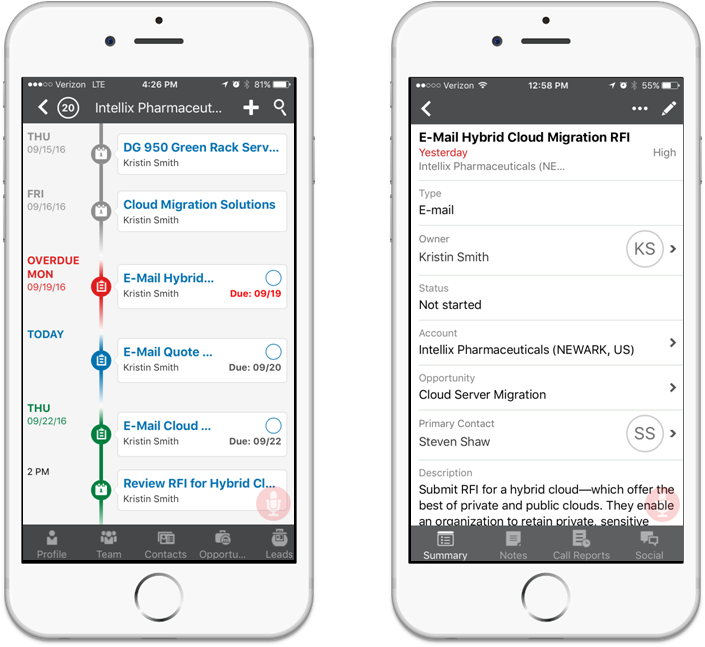 Oracle Sales Cloud mobile applications "Around Me" function to locate existing Opportunities or prospects in their current physical area. Oracle Social Network is valuable for communication on Leads and Opportunities. Monthly maintenance outage could be decreased. Multiple levels of support assigned when entering in a Service Request. More serve filters setting for the Outlook plug-in after an update. Oracle Sale Cloud is well suited for our Outside Sales Representatives in the field. Utilizing the mobile functionality greatly increases documenting Activities for a Customer accurately. Oracle Engagement Cloud (formerly Oracle Sales Cloud) is a sales enablement, sales intelligence, and sales performance management hybrid platform. It combines sales automation and intelligence, SPM (including compensation plans), partner relationship management, and sales collaboration tools. Features include: lead and opportunity management, prospecting, customer data enrichment, territory and quota balancing, goal alignment, compensation plan modeling, account management, partner selling programs, social collaboration, and sales education/knowledge management. With rich functional capabilities and a comprehensive feature set, Oracles Engagement Cloud provides a more modern approach to sales execution. Oracle Sales Cloud Landing PageAccount landing page offers a 360 degree overviewActivities Timeline shows previous and future sales activities including appointments, call reports and tasks in chronological order. Users can view the activity timeline in the context of a sales record like Account, Opportunity etc. One can mark a task complete directly in the timeline and even search across all activities for an account or an opportunity.Tapping on a contact’s initials anywhere in the mobile app brings up a contact wheel to quickly email, call, text or look up a contact on a map.Oracle Sales Cloud Analytics supports the ability to drill from high-level KPI's to detailed reports. 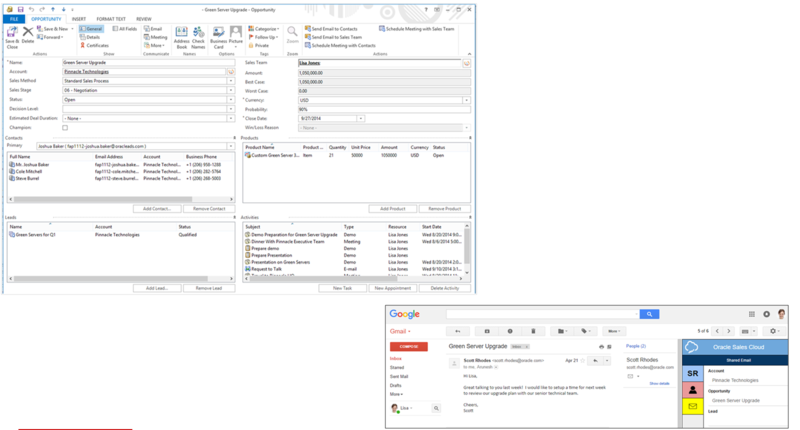 Not only can you drill into detailed report, but you can also navigate to the actual transactional record from the detailed report.Oracle Sales Cloud Productivity Suite includes seamless integrations with Microsoft Outlook, IBM Notes, Google Gmail and Office 365. Users can easily access and manage OSC data from within a familiar environment they use every day. Oracle Sales Cloud Spotlight video on top level messages and product themes of Oracle Customer Experience Cloud - Sales Cloud.